>> "CREATIVE LIVING," UTILIZING TODAY'S TECHNOLOGY WITH THE BEST OF THE PAST, TO BRING YOU INNOVATIVE IDEAS AND UP-TO-DATE INFORMATION FOR CREATIVE LIFESTYLES IN TODAY'S ACTIVE WORLD WITH YOUR HOST SHERYL BORDEN. >> THANKS FOR JOINING ME TODAY FOR "CREATIVE LIVING." WE'RE GOING TO LEARN HOW TO MAKE A FRAME USING FLOWERS AND DRAGONFLIES, WE'LL SHOW HOW TO MAKE SNACK CAKES, AND ALSO HOW TO USE PHOTO-REALISTIC STAMPS WHEN MAKING CARDS OR SCRAPBOOKING. ONE OF MY GUESTS IS LISA ROJAS, AND SHE'S A MIXED MEDIA ARTIST AND DESIGNER. 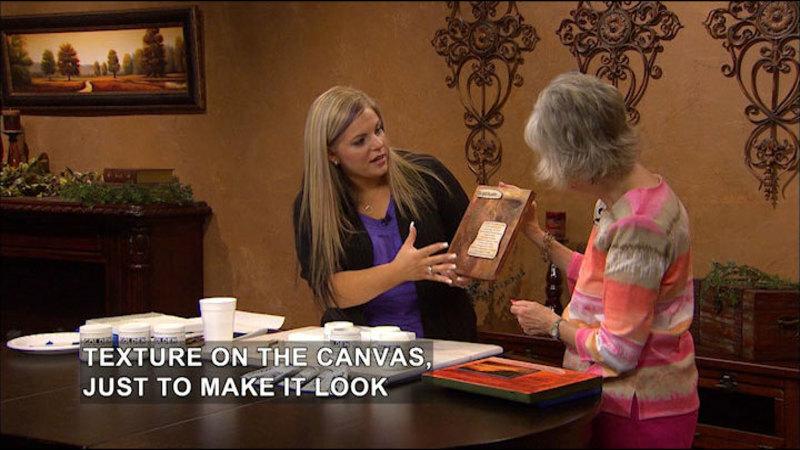 LISA'S GOING TO SHOW HOW TO DECORATE A WOODEN FRAME WITH RUBBER-STAMPED IMAGES AND CHALK PENCILS TO ADD COLOR. HER BUSINESS IS CALLED STAMPIN' QUEEN CREATIONS AND SHE'S FROM VICTORVILLE, CALIFORNIA. ANOTHER GUEST IS NANCY SEILER, AND SHE REPRESENTS WILTON BRANDS. NANCY WILL SHOW HOW TO MAKE SNACK CAKES, WHICH CAN BE DECORATED FOR ANY OCCASION AND THEY'RE GOOD FOR KIDS OR ADULT PARTIES. SHE'S FROM WOODRIDGE, ILLINOIS. AND IF YOU ALREADY DO CARDS OR DO SCRAPBOOKING, YOU KNOW HOW MANY STAMPS THERE ARE. WE'LL BEGIN THE SHOW TODAY WITH MEGAN THOME, WHO FORMERLY WORKED FOR EK SUCCESS BRANDS IN KANSAS CITY, MISSOURI. MEGAN WILL SHOW A NEW IMAGE STYLE OF STAMP IN A RANGE OF BOTANICAL DESIGNS, AND SHE'LL SHOW DIFFERENT WAYS TO USE THEM. MEGAN, THANK YOU SO MUCH FOR BEING HERE. I WAS IN OUR LOCAL CRAFT STORE A COUPLE WEEKS AGO BECAUSE I LOVE TO LOOK FOR NEW PRODUCTS, NEW THINGS TO DO FOR SCRAPBOOKING, BUT I HAVE TO ADMIT, NOT ONLY WAS THERE A HUGE VARIETY OF THINGS, BUT YOU REALLY HAVE TO KNOW WHAT YOU'RE DOING BEFORE YOU PURCHASE THEM, DON'T YOU? >> THAT'S SOMETIMES TRUE. THAT'S SOMETIMES TRUE. THERE'S A BRAND CALLED INKADINKADO THAT HAS MADE IT AS STREAMLINED AND AS EASY AS POSSIBLE. >> INKADINKADO. I LIKE THE NAME. >> WON'T FORGET THAT ONE. >> AND WE'RE TALKING ABOUT STAMPING. >> YEAH, AND THEY'VE GOT A LINE OF INTERESTING STAMPS CALLED PHOTO-REALISTIC. AND YOU CAN SEE THEM RIGHT IN FRONT OF YOU. THAT'S AN EXAMPLE OF A LOT OF THE DIFFERENT STAMPS IN THE SERIES. AND THE IDEA IS THAT IT'S MADE WITH MICRODOT PIXEL TECHNOLOGY, AND IN MY DESCRIPTION, I DESCRIBE IT AS THE IMAGE THAT YOU WOULD SEE IN A NEWSPAPER. THAT KIND OF PHOTO-REALISTIC WHERE YOU CAN KIND OF SEE THOSE LITTLE DOTS, BUT THE COLOR IS REALLY INFUSED... >> AND YOU ADD THE COLOR THAT YOU WANT, SO EACH ONE IS INDIVIDUAL. >> YOU CAN KIND OF SEE SOME EXAMPLES. THERE'S ONE IN FRONT OF YOU WITH THE SEASHELLS, AND YOU CAN SEE HOW IT'S STAMPED ON THE CARD IN FRONT OF THAT, AND THEN COLORED REALLY BEAUTIFULLY. AND THEN WHAT YOU'RE HOLDING THERE--YEAH, THAT'S THE SUNFLOWER STAMP. ISN'T THAT GREAT? AND ALL IT IS IS THE STAMP, AND THEN YOUR COLORING. THAT'S IT. SO IF YOU REALLY LIKE PALETTES AND HUES AND DIFFERENT TONES AND THINGS LIKE THAT, THEN THIS KIND OF STAMP IS FOR YOU. >> FOREVER I'VE LOVED TO COLOR. >> YEAH. WELL, LET ME SHOW YOU A LITTLE BIT ABOUT A TECHNIQUE THAT I LIKE TO USE. WE'RE GONNA MAKE SOMETHING VERY SIMILAR TO THIS FERN CARD. SO YOU CAN SEE ALL THE KIND OF GREEN TEXTURES. AND IF YOU LOOK REALLY CLOSE, YOU CAN SEE THAT MICRODOT IMAGE IN THERE, TOO. >> THAT ACTUALLY LOOKS 3-DIMENSIONAL FROM WHERE I'M LOOKING. THAT'S AMAZING. >> YEAH. AND SO WITH THAT, WE'VE GOT OUR TAG HERE. AND THEN WE'VE GOT THE FERN STAMP. AND LIKE YOU SAID, YOU CAN KIND OF GET INSPIRED BY THE IMAGE THAT'S ON THE WOOD BLOCK. WOOD BLOCKS ARE REALLY THE BEST IN THE INDUSTRY BECAUSE THEY'RE VERY STURDY. AND THEN YOU'VE GOT THE RED RUBBER ON THE BACK. THAT'S THE HIGHEST QUALITY. IT GIVES YOU THE BEST IMPRESSION. >> I DIDN'T KNOW THAT. >> YEAH. NOW YOU DO. NOW YOU DO. OK. SO WE'VE GOT THESE STACKS, AND I'M HOLDING A PIGMENT STACK AND A CHALK STACK. I DIDN'T KNOW THE DIFFERENCE BEFORE I STARTED STAMPING, EITHER. THE PIGMENT IS REALLY A SATURATED INK, AND I LIKEN IT TO OIL PAINT, RIGHT? IT TAKES A LITTLE BIT LONGER TO DRY, BUT THE SATURATION IS REALLY DENSE. THE CHALK, ON THE OTHER HAND, IS LIGHT AND SOFT. IT'S PERMANENT, BUT IT TAKES NOTHING TO DRY, REALLY. >> OH, SO YOU'RE COMBINING THOSE. OH, I'VE NEVER DONE THAT. >> YEAH. AND THE GREAT THING ABOUT THESE STACKS IS THAT THEY'RE ALREADY COLOR-COORDINATED, AND YOU CAN GET THE SAME COLORS IN BOTH PIGMENT AND CHALK. >> NO THINKING THERE. >> SO EASY. SO WE'RE GONNA START WITH THE LIGHTEST COLOR OF PIGMENT, AND I'VE GOT MY FERN HERE, AND YOU'RE GONNA PRESS SO IT'S REALLY SATURATED. AND MY FRIEND ARLENE TELLS ME TO MAKE THE INK PAD DANCE. OK? >> SO YOU'RE TWISTING IT JUST A LITTLE BIT. I CAN SEE THAT. >> KEEP IT MOVING, KEEP IT MOVING, AND YOU REALLY WANT TO PRESS, BECAUSE YOU WANT THAT INK REALLY GOOD AND DOWN IN THERE. AND PLUS, YOU DON'T WANT TO GET ANY LINES FROM YOUR STAMP, YOU KNOW. SO I LIKE A GOOD, GREEN COVERAGE THERE. AND THEN I'M GONNA GO IN WITH MY CHALK. >> OH, SO YOU'LL USE THE CHALK... >> ON TOP. >> ON TOP OF IT. I THOUGHT MAYBE IT WOULD BE AFTERWARDS. >> AND AGAIN, YOU'RE GONNA USE THE LIGHTEST COLOR FIRST, AND YOU'RE JUST--I'M JUST GONNA GO THROUGH THE CENTER THERE A LITTLE BIT. AGAIN, WE'RE GONNA DANCE. NOT QUITE AS MUCH PRESSURE. >> YOU'RE WANTING TO PLACE IT WHERE YOU WANT IT. >> RIGHT. AND THEN I'VE GOT THE GREEN CHALK THAT I'M GONNA COME BACK IN WITH. YEAH. JUST COME IN THERE. AND THE CHALK ACTUALLY ABSORBS SOME OF THE... >> THE PIGMENT? >> YEAH, THE PIGMENT. KIND OF THAT HARD-TO-DRY PART OF THE PIGMENT. AND THEN ANOTHER THING THAT I'M GONNA DO IS GO BACK IN, WITH KIND OF A DARKER PIGMENT, AND I'M JUST GONNA HIT THE EDGES. BECAUSE THAT'S HOW YOU WOULD SEE IT IN NATURE, RIGHT? AND I MIGHT DO A LITTLE ON THE STEM THERE. SO I'M JUST GONNA... >> I CAN'T WAIT TO SEE YOU STAMP THIS. >> ME, EITHER. HA HA HA! OK. SO THIS IS A LITTLE BIT LARGER THAN OUR TAG, SO I'M HOPEFULLY GOING TO ANGLE IT A LITTLE BIT THERE. >> UH-HUH. >> AND THEN WHEN YOU PRESS DOWN, GO STRAIGHT DOWN. NO ROCKING. >> DON'T WIGGLE IT NOW. >> RIGHT. >> OK. >> AND SO THERE WE'VE GOT OUR FERN IMAGE, BUT WE'RE NOT DONE YET. >> I JUST WANT TO LOOK AT THAT. >> SO IT LOOKS KIND OF LIGHT, RIGHT? >> KIND OF A PASTEL. >> WHICH IS OK. YEAH, BUT WE'RE GONNA GO IN AND ADD, WITH OUR BLENDING CHALK--I'VE GOT THIS BLENDING CHALK TOOL HERE--AND I'M GONNA GO IN. I'VE GOT KIND OF THIS CHARTREUSE COLOR. AND THIS IS REALLY GONNA BRING OUT SOME OF THE GREEN, AND YOU'RE GONNA JUST KIND OF WIGGLE IT BACK AND FORTH DOWN THE CENTER. >> AND IT'S SORT OF TYING THOSE COLORS TOGETHER, TOO. >> YOU'RE EXACTLY RIGHT. SO YOU CAN SEE IT KIND OF ADDS A LITTLE BIT MORE VIBRANCY. WHAT I LIKE ABOUT THE BLENDING CHALKS IS THAT YOU REALLY GET MORE CONTROL OUT OF YOUR COLOR. YOU DECIDE WHERE THAT GOES, AND THIS MAY SEEM REALLY INTERESTING, BUT I'M GOING TO--ARLENE TELLS ME THAT IN NATURE, FERNS HAVE A LITTLE BIT OF THIS KIND OF BLUE-GREEN TINT ON THE EDGES. YOU WOULD NEVER USE THAT, RIGHT? YOU WOULD NEVER THINK-- >> I WOULD NEVER THINK ABOUT PUTTING THAT ON IT. >> BUT THE TRICK IS THAT YOU WANT TO GET MOST OF THAT BLUE OFF ON A PIECE OF SCRATCH PAPER, AND THEN YOU JUST KIND OF COME IN AND HIT A LITTLE BIT...JUST A LITTLE BIT ON THESE EDGES, AND IT JUST BRINGS OUT A LITTLE BIT OF THOSE COLORS. AGAIN, YOU WOULD NEVER THINK THAT... >> I'VE NEVER BLENDED THE COLORS LIKE THAT, EITHER, TO START WITH. I THINK THAT'S REALLY INTERESTING, AND THEN EVERYTHING YOU'VE ADDED TO IT HAS JUST BEEN MUCH MORE REALISTIC. >> THAT'S RIGHT. AND THEN WHAT I'M GONNA DO HERE, I'M GONNA PICK THE BROWN, AND JUST TO KIND OF FINISH OFF THE TAG, I LIKE TO... >> OH. UH-HUH. I THINK THAT KIND OF ANTIQUES IT, OR I DON'T KNOW WHAT IT DOES, BUT IT DOES, IT FINISHES IT. >> RIGHT. IT JUST MAKES IT A LITTLE FINISHED. AND SO WHAT YOU DO IS JUST ADD A LITTLE FIBER OR ADD A RIBBON UP HERE, AND THEN YOU WOULD ATTACH IT TO YOUR CARD. I'VE GOT A CARD HERE. YOU CAN USE NEWSPRINT OR SCRAPBOOK PAPER OR WHATEVER YOU HAVE. AND THEN YOU'VE GOT YOUR... >> WELL, ISN'T THAT PRETTY? >> AND THE GREEN PULLS OUT HERE. BUT AGAIN, YOU CAN ADD EXTRA STUFF LIKE WE'VE DONE HERE. YOU'VE GOT YOUR TWINE, AND YOU'VE GOT YOUR LITTLE POPPED-UP-- >> 3-DIMENSIONAL. >> MM-HMM. AND WE'VE ADDED A DOUBLE MAT TO THIS ONE. >> IT'S AMAZING. IT GOES FROM ALMOST FINISHED TO A TOTALLY PROFESSIONAL CARD. >> RIGHT. RIGHT. WELL, THAT'S INTERESTING, HOW TO USE THE STAMPS AND THE DYE. I JUST HAD NEVER THOUGHT ABOUT MIXING THEM LIKE THAT. >> I DIDN'T KNOW EITHER. >> THAT'S AMAZING. THANK YOU FOR SHOWING THIS. >> THANK YOU. >> NANCY, THANKS SO MUCH FOR BEING HERE. WHEN YOU SAID WE WERE GOING TO WORK ON SMALL CAKES, I THOUGHT, "WELL, MAYBE MADE IN THE MUFFIN TIN." THAT'S WHAT I USUALLY MAKE SMALL CAKES IN. YOU'VE COME A LONG WAY. >> WE HAVE. WE'VE COME OUT WITH SOME NEW PANS WHERE YOU CAN MAKE RECTANGLES OR ROUNDS OR LOGS OR SOME DOMES, AND, YOU KNOW, IT'S NICE THAT YOU CAN PERSONALIZE THE FLAVOR THAT YOU HAVE, OR IF YOU REALLY DON'T WANT TO DO BAKING, YOU CAN ACTUALLY TAKE A PRE-MADE SNACK AND EMBELLISH IT SO THAT IT'S PERFECT FOR ANY THEME OR THE PERSON THAT YOU'RE MAKING IT FOR. >> WELL, LET'S TAKE A LOOK. HERE WE HAVE SOME RECTANGLES, AND YOU ACTUALLY HAVE THE PAN THAT MAKES THESE LITTLE, SMALL--AND FOR SOME REASON, LITTLE, SMALL CAKES ARE SO MUCH BETTER THAN JUST A SLICE OF A BIG CAKE. >> WELL, THEY ARE. IT'S ALMOST LIKE I MADE THIS INDIVIDUALLY FOR YOU, SO IT MAKES IT REALLY SPECIAL. THAT'S KIND OF ONE OF THE SPECIALTIES OF THE CUPCAKE THROUGH THE YEARS. YOU KNOW, WE'VE GOT THE ROUNDS, AND I MADE THOSE WHIMSICAL BECAUSE I THOUGHT THAT WOULD BE FUN FOR THE KIDS. YOU KNOW, IF YOU WANT SOMETHING MORE ELEGANT, THE DOME WITH SOME COCONUT ON TOP, OR YOU COULD COVER IT ALL IN NUTS. >> THAT LOOKS JUST LIKE THE ONES THAT YOU SEE IN THE STORE. >> YEAH, AND THEN YOU ALSO CAN MAKE THE LOGS, AND WE'RE GONNA DIP THEM IN SOME CHOCOLATE SO THAT YOU CAN SEE HOW GREAT THAT IS. BUT LET'S GO AHEAD AND GET STARTED. SO LET'S SAY THAT YOU BAKED YOUR CAKE, AND THESE ARE--I HAVE ONE OF THE LOGS, AND I'M GOING TO TAKE THIS BISMARCK TIP. AND THIS IS A NUMBER 230. IT'S A LONG ONE. IT'S COVERED UP A LITTLE BIT, BUT IT'S THIS LONG, AND THIS IS USED FOR FILLING THINGS, SO IT'S GOT A ROUND-- >> IT GOES WAY INSIDE. >> IT GOES WAY INSIDE, SO IT'S GOOD FOR CANNOLIS. 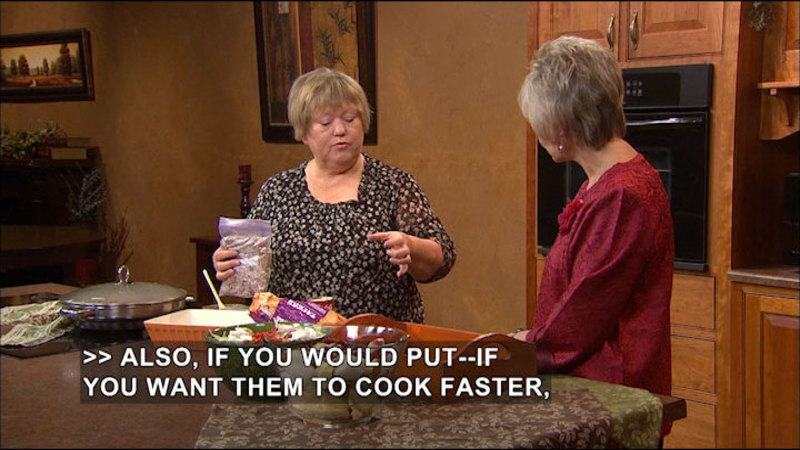 WHAT I'M GOING TO DO IS I'M GOING TO PUSH IT WAY IN, AND THEN YOU CAN SEE FROM THE OUTSIDE OF THE BAG I'M JUST KIND OF SQUEEZING IT. >> OH, AND IT DOESN'T MAKE A BIG HOLE IN IT, BECAUSE YOU DON'T WANT THAT TO SHOW. >> AND THEN I CAN DO IT FROM THIS SIDE, AND I'M LOSING A LITTLE BIT THERE, BUT I CAN JUST WIPE THAT PART OFF WITH A PAPER TOWEL OR WITH MY FINGER AND THEN PUT IT ON A PAPER TOWEL. SO YOU CAN SEE IT HAS--IF YOU REALLY WANT TO MAKE SURE YOU GET IT WAY IN THE MIDDLE, YOU NEED TO STICK IT WAY IN, OR YOU COULD FILL FROM UNDERNEATH. >> FROM THE BOTTOM. >> SO THEN WHAT I'M GONNA DO IS I'M GONNA TAKE IT AND I'M GONNA DIP IT IN THIS MELTED CHOCOLATE. AND ACTUALLY THIS IS CANDY MELT, SO YOU DON'T HAVE TO WORRY ABOUT TEMPERING IT. THEY COME IN THESE LITTLE ROUND DISKS. >> LOTS AND LOTS OF COLORS. THAT'S WHAT'S WONDERFUL ABOUT USING-- >> EASY TO MELT. HALF POWER. SO 50% OR DEFROST ON YOUR MICROWAVE, AND THEN MIX IT TOGETHER. DO IT FOR ABOUT A MINUTE, AND THEN JUST DO IT, LIKE, IN 30-SECOND INCREMENTS. SO I'VE GOT THAT THERE. NOW THAT LOOKS KIND OF PLAIN, SO I CAN EITHER PUT SOME SPRINKLES OR SUGAR OR SOME JIMMIES OR NONPAREILS ON IT. BUT I'M STAYING WITH A PARTICULAR THEME, SO I'VE GOT THESE SAME CANDY MELTS THAT I'VE MELTED IN RED. >> JUST ONE OF THE MANY COLORS. WOW. >> AND THAT'S ALL I NEED TO DO TO MAKE IT LOOK GREAT. IF I DID A WHOLE TRAY OF THEM, THEN I'D PUT IT IN THE REFRIGERATOR FOR ABOUT 5 MINUTES, AND THEN IT LOOKS REALLY NICE, I THINK. >> UH-HUH. >> NOW HERE'S A ROUND. AND I'M NOT GONNA FILL THAT BECAUSE YOU KIND OF BASICALLY USE THE BISMARCK TIP TO FILL IT AGAIN. WHAT I'M GONNA DO IS I'M GONNA ICE IT WITH SOME ICING, AND WHEN YOU ICE, YOU WANT TO JUST PUT IT IN THE MIDDLE AND SPREAD IT AROUND THE OUTSIDE. >> JUST LIKE WE WOULD A CUPCAKE. >> JUST LIKE YOU WOULD A CUPCAKE. AND THEN I--ACTUALLY WE'LL PULL A LITTLE BIT MORE THERE. AND THEN EYEBALLS HAVE BEEN JUST REALLY POPULAR. >> I'VE NEVER SEEN THIS. >> THIS WOULD BE CUTE FOR THE KIDS. I'M JUST GONNA DO A SINGLE EYEBALL BECAUSE I'VE GOT SOME KIND OF A CRAZY LITTLE MONSTER, AND THEN THESE JUMBO STAR SPRINKLES IS GONNA BE HIS MOUTH. AND I MEAN, YOU COULD USE JIMMIES. YOU COULD USE LICORICE IF YOU WANTED TO, OR ANY KIND OF A CANDY, BUT WHO WOULDN'T WANT TO COME HOME FROM SCHOOL AND ENJOY THAT? >> OH, AND I'M JUST THINKING ABOUT HALLOWEEN. WOULDN'T IT BE FUN TO MAKE LITTLE MONSTERS? >> OH, YEAH. SO LET'S MOVE THIS OUT OF THE WAY, AND THEN I WANT TO SHOW YOU WHAT YOU CAN DO WITH THE RECTANGLE. AND WITH THIS--THIS IS THE RECTANGLE. IT'S GOT JUST SOME ICING IN BETWEEN, BUT YOU COULD FILL IT WITH ANYTHING THAT YOU PARTICULARLY WANTED, AND I WANTED TO SHOW YOU THIS PARTICULAR TIP. THIS IS A BASKET WEAVE OR LATTICE-TYPE TIP. THIS IS A 2B. THIS IS THE BIG ONE, BUT A TIP NUMBER 45, IF YOU HAVE THAT AT HOME, WOULD BE SOMETHING THAT YOU COULD ALSO USE. >> I THINK I HAVE THE 45 OR 47 OR SOMETHING LIKE THAT. >> IT'S PRETTY STANDARD. AND THEN YOU COULD DO STRIPS ACROSS. NOW, THIS IS JUST BUTTER CREAM ICING. >> MM-HMM. >> I'M GONNA GET A LITTLE CREATIVE HERE AND DO SOME STRIPS THIS WAY, AND YOU COULD TRY TO DO THIS WITH A SPATULA IF YOU WANTED. >> THAT WOULD BE KIND OF TOUGH. >> I DON'T THINK I WOULD. I'M KIND OF A, GET THE TIPS OUT. AND THEN JUST SPRINKLE SOME OF THESE ON TOP. >> YOU KNOW, YOUR COMPANY HAS MADE IT SO EASY FOR LOTS OF US TO CREATE SO MANY SPECIAL TREATS, EVEN IF WE'RE NOT A PROFESSIONAL DECORATOR LIKE YOU ARE, AND THAT'S WHAT'S FUN. >> WE REALLY TRY TO MAKE IT AMAZING, MAKE IT EASY FOR PEOPLE TO MAKE THEIR TREATS AMAZING, AND I THINK THIS--YOU KNOW, YOU MIGHT NOT SAY THIS IS AMAZING, BUT THIS IS REALLY AMAZING, ESPECIALLY IF YOU'RE NOT A CAKE DECORATOR, OR MAYBE YOU HAVEN'T USED WILTON PRODUCTS BEFORE. YOU CAN SEE JUST TO GET RID OF THE EXTRAS. AND THEN SINCE I'M A THRIFTY GIRL, I WOULD REUSE THOSE. NOW, HERE'S ANOTHER LITTLE TIP. YOU COULD USE A DISPOSABLE DECORATING BAG AND CUT THE END OF IT AND THEN JUST REALLY CHANNEL IT IF YOU WERE TRYING TO DO SOME FINE WORK WITH YOUR JIMMIES OR YOUR SUGARS OR SOMETHING LIKE THAT. >> OH. UH-HUH. >> BUT BY USING THE TIP, YOU GET THE CLEAR DELINEATION OF THE LINES. >> WELL, IN LOOKING BACK AT ALL THE ONES THAT YOU'VE DECORATED, IT REALLY DOES--I LIKE THE DOME SHAPE. THAT WOULD BE A FUN ONE TO DO, TOO. >> THAT LOOKS SO TASTY. I'LL FIGHT YOU FOR IT WHEN WE FINISH. >> OK. YOU COULD PUT INITIALS OF THE PERSON FOR A PARTY IF YOU WANTED TO DO THAT. THERE'S JUST LOTS OF THINGS THAT, LIKE I SAY, THE HALLOWEEN WOULD BE ESPECIALLY FUN WITH THE EYEBALLS. >> YES, AND YOU COULD REALLY DO IT FOR ANY EVENT. WITH ST. PATRICK'S DAY, YOU COULD DO GREEN; VALENTINE'S, PINK. I MEAN, YOU COULD PICK ANY HOLIDAY. SO THESE ARE PERFECT FOR EVERY DAY AS WELL AS ANY SEASON. >> WELL, THANK YOU SO MUCH FOR SHARING SOME OF THESE NEW IDEAS WITH US. >> LISA, THANK YOU SO MUCH FOR COMING. 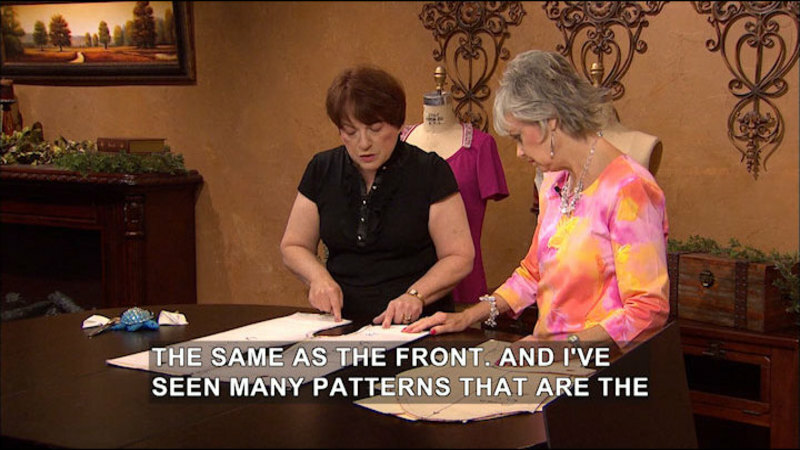 IT'S REALLY OBVIOUS, LOOKING AT THE SAMPLES THAT YOU BRING, THAT YOU LIKE DETAIL WORK. YOU REALLY ENJOY THAT, DON'T YOU? >> YES, I DO. I DO ENJOY IT. >> AND YOU DON'T MIND TAKING DAYS TO WORK ON A PROJECT. >> NO, I DON'T, UNLESS I HAVE A DEADLINE. THEN THAT'S A LITTLE DIFFERENT, BUT NO. I ENJOY TAKING MY TIME, AND I THINK--TO ME, THE BEST PROJECTS ARE THE ONES THAT HAVE THE FINE DETAILS TO THEM, AND THAT'S JUST HOW I WORK. >> AND I LIKE DOING SCRAPBOOKING AND CARDMAKING AND THINGS, BUT ONE THING I'VE NEVER DONE IS USE THE SHADING PENCILS. I GUESS I STILL REMEMBER MAT PENCILS FROM SCHOOL, AND I DIDN'T CARE FOR HISTORY TOO MUCH, SO THAT DOESN'T HAVE A GOOD MEMORY FOR ME. BUT LET'S TAKE A LOOK AT SOME THINGS--IN FACT, YOU'RE GOING TO SHOW US HOW TO MAKE THIS LITTLE FRAME, RIGHT? >> YES. >> UH-HUH. >> YES. >> AND THE SHADING IS DONE IN CERTAIN PLACES. WE MIGHT JUST SHOW--THIS IS JUST A LITTLE INEXPENSIVE WOODEN FRAME. YOU PAINTED IT WITH AN ACRYLIC PAINT, AND ANY COLOR THAT WE WANT. AND THERE ARE SOME THAT ARE DESIGNED ESPECIALLY FOR WOOD PROJECTS. >> RIGHT. THAT'S JUST A PLAIN ACRYLIC. >> AND THEN ALL THE STUFF YOU ADDED--IT'S UP TO US. >> A LOT OF STUFF. THAT'S WHAT WE'RE GONNA DO. >> AND HERE'S AN EXAMPLE OF A LITTLE CARD, AND THIS CUTE LITTLE BOX IS WHAT YOU STORE THESE CARDS IN. AND THIS IS DUCT TAPE. >> YES. YUP, THAT'S DUCT TAPE. >> VERY CLEVER. >> BUT THIS IS JUST ANOTHER WAY TO SHOW HOW TO USE CHALK PENCILS. >> CHALK PENCILS. >> AND YOU CAN KIND OF GET A WATERCOLOR LOOK WITH THEM. THAT'S WHAT I'M GONNA SHOW YOU. >> THIS IS JUST DARLING. LOOK AT THIS LITTLE SHOVEL AND LITTLE RAKE THAT YOU'VE PUT ON TOP. WHAT A GREAT GIFT THIS WOULD BE--TEACHERS OR, WELL, ANYBODY. THIS HOLDS THESE LITTLE CARDS. >> YUP. >> AND YOU'VE DONE SOME SHADING AND WORK ON THESE. >> YEAH. >> I THINK SOMETIMES WHEN YOU LOOK AT THIS, UNTIL WE SEE WHAT YOU'RE GOING TO DO, IT'S HARD TO TELL, DID THIS COME PAINTED LIKE THAT ALREADY, OR DID YOU ADD IT? >> NO. THAT WAS WHITE CARDSTOCK THAT I STAMPED AND COLORED AND WENT FROM THERE. >> THAT'S AMAZING. I THOUGHT IT CAME LIKE THAT. >> NO. >> OK, SO JUST WHITE CARDSTOCK. >> THAT'S ALL WE DID. I JUST TOOK A PIECE OF WHITE CARDSTOCK FOR THE FLOWERS, AND MY BLACK INK PAD AND MY STAMP. >> LET IT DRY BEFORE YOU START. >> LET IT DRY. AND THEN YOUR PENCILS--THESE ARE PENCILS FROM FABER-CASTELL. I ABSOLUTELY LOVE THEIR PENCILS. AND THERE'S DIFFERENT WAYS THAT YOU CAN DO THIS. OK, NOW THIS IS THE EASIEST WAY. THIS IS HOW I DO IT AT HOME A LOT OF THE TIMES WHERE, UNLESS I WANT REALLY, REALLY FINE DETAIL, BUT IF I JUST WANT A LITTLE BIT OF DETAIL OR SOME WATERCOLOR LOOK, THEN THAT'S WHAT I USE. AND I JUST COLOR IT IN... >> YOU CAN GET OUT OF THE LINES. THAT'S OK. >> IT DOESN'T MATTER, ESPECIALLY ON THIS BECAUSE I'M GONNA CUT IT OUT ANYWAYS. SO IT DOESN'T REALLY MATTER. AND THEN ON THIS, THEN, WHAT I'M GONNA DO IS I'M GONNA TAKE A DEEPER SHADE OF THE PURPLE. YOU KNOW, I STARTED WITH THE LAVENDER, SO NOW I'M GONNA TAKE A PURPLE AND JUST KIND OF GO AROUND THE SIDES JUST LIKE THIS. NOW, THERE'S DIFFERENT WAYS--YES. THERE'S DIFFERENT WAYS, NOW, THAT YOU CAN DO IT WHEN YOU GET TO THIS POINT. THIS IS A BLENDER PAN. >> OH. NEVER USED ONE OF THOSE. >> YEAH. NICE. THESE ARE REALLY NICE. I LOVE THEM TO DEATH. AND YOU JUST TAKE THEM AND YOU JUST START, LIKE, YOUR COLORING. AND YOU TAKE THE LIGHTEST COLOR FIRST, AND THEN YOU COME BACK IN AND YOU PULL... >> ON THOSE EDGES. >> YOU PULL YOUR EDGES IN, AND THAT'S WHAT'S GONNA GIVE YOU YOUR SHADING. AND THEN WHEN YOU START GETTING--WHEN YOU'RE COLORING A LOT AND YOU GET A LOT OF INK OR A LOT OF CHALK ON YOUR BLENDER PEN, YOU JUST TAKE IT AND WIPE IT OFF. >> SO IS THERE ANYTHING IN THERE? IS THERE WATER? >> IT'S NOT A WATER. IT'S SOME TYPE OF A SOLUTION. IT'S A BLENDING SOLUTION. >> AND SO YOU CAN BUY MORE TO FILL IT UP. >> YES. YOU CAN BUY MORE TO FILL IT UP. I'VE GOT SOME STUCK IN HERE. HERE WE GO. AND THEN YOU CAN ALSO-- >> "BLENDER REFILL." >> RIGHT. YOU CAN ALSO BUY THE NIBS. >> THAT'S THE TIP. >> THE TIP, AND THOSE ARE ALSO REPLACEABLE. BUT WHEN YOU GET TOO MUCH COLOR, YOU JUST TAKE IT OVER TO-- >> WIPE IT OFF. >> WIPE IT OFF. NOW, THAT'S ONE WAY TO DO IT. ANOTHER WAY TO DO IT IS TO TAKE A LITTLE TINY COTTON BALL. >> UH-HUH. OK. >> AND THIS IS JUST A LITTLE PICKER-UP THINGY THAT I HAVE AT HOME. AND THEN I JUST TAKE IT AND COLOR IT IN LIKE THIS. >> OH. THAT REALLY DOES SOFTEN IT, DOESN'T IT? >> YES. THIS IS GOING TO SOFTEN IT QUITE A BIT. IT'S GOING TO PICK UP A LOT OF YOUR COLOR. >> OH, THAT LOOKS LIKE FUN. SEE, I WOULD LIKE DOING THAT. IT'S JUST LIKE COLORING. >> OK, AND THEN THE SAME THING YOU CAN DO WITH AN APPLICATOR. >> OH, A MAKE-UP BRUSH. >> A MAKE-UP APPLICATOR. IT'S THE SAME THING. I LIKE USING THESE BETTER BECAUSE I CAN GET INTO THE DETAILS OF THE STAMP EASIER. >> I SEE. >> YOU KNOW, IT'S A LOT EASIER TO USE WITH THESE. AND THEN THE LAST THING THAT YOU CAN DO, THERE'S ANOTHER CHALK ENHANCER OUT. THIS IS ANOTHER ONE. AND YOU CAN ALSO USE-- >> CHALK ENHANCER. >> YOU CAN ALSO USE IT WITH A PAINTBRUSH. >> IT'S NOT WATER. >> NO. IT'S SOME TYPE OF A SOLVENT, AND I CAN'T TELL YOU WHAT IT IS. >> ACID-FREE. NON-TOXIC. >> RIGHT. AND YOU CAN USE IT ON ALL YOUR SCRAPBOOKING AND STUFF. AND IT WORKS THE SAME WAY AS THE BLENDER PEN DOES, BUT YOU CAN JUST--YOU KNOW, IF YOU'RE MORE USED TO USING A BRUSH... >> YOU CAN USE THAT. >> YOU CAN USE THE BRUSH INSTEAD. I PREFER TO USE THE BLENDER PEN. IT'S EASIER FOR ME. BUT IT'S THE SAME THING, AND YOU JUST PICK UP THE COLOR THIS WAY. AND THAT'S HOW I DID THE FLOWERS. >> THAT IS REALLY PRETTY. >> YEAH, AND THEN WHEN YOU'RE DONE, YOU GET SOMETHING KIND OF LIKE THIS. NOW, YOU'RE GONNA WANT TO SET THESE. ONE OF THE THINGS THAT I REALLY, REALLY LIKE A LOT IS THE PRESERVE IT! FROM KRYLON, I BELIEVE, MAKES IT. IT'S BEAUTIFUL ON CHALK. THESE HAVE NOT BEEN PRESERVED YET, BUT I DID DO THESE. BUT WITH YOUR CHALKS, ANYTIME YOU'RE USING CHALKS, YOU DON'T WANT IT TO RUB OFF. YOU CAN EVEN USE A HAIRSPRAY ON CHALKS. >> OH, OK. >> YOU KNOW, A VERY CHEAP HAIRSPRAY. JUST SOMETHING TO JUST PUT IT ON AND LET IT GO, AND YOU'RE FINE. >> THAT SETS IT. >> THAT SETS IT. >> AND THEN WE'RE READY JUST TO HAVE FUN. >> AND THEN WE'RE READY TO PUT EVERYTHING TOGETHER. >> BUT NOW, LOOKING BACK AT THE THINGS THAT YOU MADE, IT'S AMAZING. I THOUGHT THEY JUST CAME LIKE THAT, BUT YOU COLORED EVERY ONE OF THEM. >> YES. THAT STARTS OUT WITH WHITE CARDSTOCK, AND THE COLOR ON THERE IS ALL DONE FROM ME. >> SO YOU'VE PAINTED THIS. YOU PUT A PIECE OF SCRAPBOOKING PAPER ON THE FRONT, DECORATED THE EDGES, AND NOW YOU'RE READY TO--BUT YOU COLOR--YOU DO ALL YOUR COLORING. >> I DO ALL OF MY COLORING AND CUTTING OUT FIRST, AND THEN WHAT I DID, I HAVE A LITTLE VASE HERE. SET IT IN THE CENTER. AND THEN I TOOK MY FLOWERS AND I PUT LITTLE BRADS IN THE CENTER OF THEM. >> SO YOU CAN LAYER IT--PUT 2 OR 3 SETS OF PETALS. 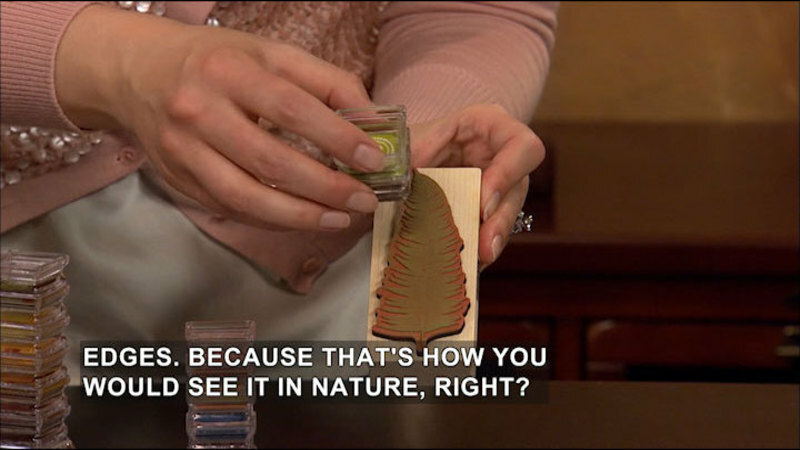 >> YES, AND THESE STAMPS YOU CAN DO THAT WITH BECAUSE THEY COME IN THE DIFFERENT LAYERS, SO YOU CAN PEEL THEM APART, AND THEN YOU CAN KIND OF... >> KIND OF BEND THEM, MOLD THEM. >> THAT'S WHAT I DID WITH THIS. I KIND OF MOLDED THEM A LITTLE BIT SO THEY LOOK MORE REALISTIC. AND THEN THAT'S ALL YOU DO. THEN YOU JUST KIND OF PUT EVERYTHING IN TOGETHER. >> AND DON'T YOU THINK IT'S A GOOD IDEA TO SORT OF PLAN IT OUT BEFORE YOU START GLUING IT DOWN? >> YES. I ALWAYS PLAN EVERYTHING OUT BEFORE I GLUE BECAUSE, YOU KNOW, ONCE YOU GLUE... >> IT'S TOO LATE. >> YOU'RE STUCK. SO YOU WANT TO BE ABLE TO MOVE IT AROUND, AND IF YOU DON'T LIKE IT LIKE THAT, YOU CAN CHANGE IT. AND THEN THE FLOWERS--THE FLOWERS WERE SOMETHING THAT WERE VERY SIMPLE. I USED A DIE-CUT MACHINE WITH THE GUIDE. >> SO YOU DIDN'T COLOR THESE. >> THESE ARE PATTERN PAPER, AND I JUST RAN IT THROUGH THE BIG SHOT MACHINE, THE DIE-CUT, AND THEN I JUST TOOK MY DECORATIVE SCISSORS AND WENT AROUND AND GAVE THEM THAT PRETTY DECKLE EDGE. THERE YOU GO. AND THEN THE LAST THING THAT YOU DO IS YOU JUST PUT EVERYTHING TOGETHER, AND YOU'VE GOT YOUR LITTLE-- >> WE'LL TAKE A LOOK AT THIS ONE AS YOU CONTINUE TO BUILD. AND TOPPED IT OFF WITH A DIMENSIONAL BUTTERFLY ON A WIRE SPRING. >> MM-HMM. AND YOU KNOW, THE WIRE IS VERY EASY TO DO, ALSO. JUST TAKE IT AND CURL IT AROUND. CURL IT AROUND A PENCIL, A PAINTBRUSH, WHATEVER YOU'VE GOT IN YOUR STUDIO. >> DEPENDING ON HOW TIGHT YOU WANT IT. >> DEPENDING ON HOW TIGHT YOU WANT IT, AND THAT'S IT. THE ONLY OTHER THING THAT I USED WAS THE FOAM TAPE TO GIVE IT THE DIMENSIONS. >> I CAN SEE THAT. MAYBE FROM THE SIDE RIGHT IN HERE YOU CAN SEE THE FOAM. >> YEAH. JUST TO GIVE IT SOME MORE DIMENSION, YOU KNOW, AND THEN IT'S ALSO FINISHED ON BOTH SIDES. SO YOU CAN SEE IT FROM BOTH SIDES AND IT LOOKS NICE. >> SO FUN. EVERYTHING THAT YOU'VE MADE, IT JUST LOOKS LIKE SO MUCH FUN. IT WOULD BE SUCH A GREAT GIFT TO GIVE TO SOMEONE. I THINK THEY'D REALLY APPRECIATE THE EFFORT THAT YOU PUT OUT. >> OH, GREAT. THANK YOU. >> THANK YOU, LISA. >> MM-HMM. >> I HOPE YOU ENJOYED THE SHOW TODAY. NEXT TIME ON "CREATIVE LIVING," WE'LL LEARN HOW TO MAKE BEER-BATTERED ARTICHOKE FRITTERS, WE'LL TALK ABOUT ADOPTING HOMELESS ANIMALS, AND DEMONSTRATE USING ELABORATE STENCILS ON SOME PROJECTS. ONE OF MY NEXT GUESTS IS A COOKBOOK AUTHOR AND CHEF, AND HE'LL DEMONSTRATE HOW TO MAKE A SIMPLE BEER BATTER, THEN COAT THE ARTICHOKE HEARTS TO SERVE WITH A DIPPING SAUCE. ANOTHER GUEST IS WITH A GROUP CALLED GUARDIANS OF RESCUE, AND HE'S GOING TO EXPLAIN HOW TO ADOPT A PET. HE STRONGLY SUGGESTS GOING THROUGH A SHELTER TO HELP REDUCE THE 6 MILLION TO 8 MILLION ANIMALS THAT ARE KILLED EACH YEAR. AND FINALLY, ONE OF MY NEXT GUESTS WILL SHOW HOW TO EASILY CREATE BEAUTIFUL ARTWORK BY SIMPLY TRACING. YOU CAN EVEN USE THE EDGES OF STENCILS TO CREATE COORDINATING FRAMES AND BORDERS. ALL OF THESE TOPICS WILL BE FEATURED ON THE NEXT "CREATIVE LIVING" SHOW. IF YOU EVER HAVE COMMENTS OR SUGGESTIONS OR IDEAS FOR SHOWS, YOU CAN EMAIL ME AT SHERYL.BORDEN@ENMU.EDU. I'D ALSO LIKE TO ASK YOU TO BECOME A FAN OF "CREATIVE LIVING" ON FACEBOOK. 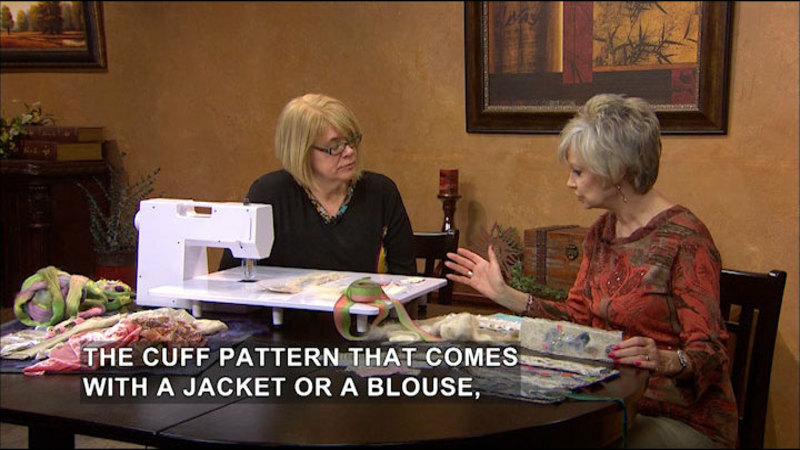 JUST GO TO FACEBOOK.COM, AND IN THE SEARCH WINDOW, TYPE IN "CREATIVE LIVING WITH SHERYL BORDEN." THANKS SO MUCH. I HOPE YOU'LL PLAN TO JOIN ME NEXT TIME FOR "CREATIVE LIVING." >> WE ARE VERY PLEASED TO OFFER A NEW BOOKLET THAT ACCOMPANIES THIS SERIES OF "CREATIVE LIVING." THIS BOOKLET IS TITLED THE 6600 SERIES, AND IT FEATURES A WONDERFUL COLLECTION OF IDEAS AND INFORMATION AND IT'S AVAILABLE FREE OF CHARGE ON OUR WEBSITE. POSTED AS A PDF FILE, YOU CAN SIMPLY DOWNLOAD THE ENTIRE BOOKLET OR JUST THE SEGMENTS YOU'RE MOST INTERESTED IN. AS WITH ALL THE "CREATIVE LIVING" BOOKLETS, YOU'LL FIND INFORMATION ON FOODS AND NUTRITION, CLOTHING AND FASHION, HEALTH AND BEAUTY, HOME DECORATING AND MUCH MORE. FOR YOUR COPY OF THIS BOOKLET, GO TO OUR WEBSITE AT KENW.ORG AND THEN CLICK ON "CREATIVE LIVING." SCROLL DOWN TO THE BOOKLET SECTION AND YOU CAN CLICK ON THIS BOOKLET OR ANY OF THE OTHER BOOKLETS WE HAVE AVAILABLE ONLINE. ONCE AGAIN, JUST GO TO KENW.ORG, CLICK ON "CREATIVE LIVING," AND DOWNLOAD THE BOOKLET, TITLED THE 6600 SERIES. WE ALSO WANT TO ENCOURAGE YOU TO SIGN UP FOR OUR FREE E-NEWSLETTER. JUST CLICK ON THE SIGN UP NOW BUTTON AND INPUT YOUR EMAIL ADDRESS. THAT'S ALL THERE IS TO IT. YOU'LL ENJOY READING AN UP-TO-DATE NEWSLETTER FILLED WITH INTERESTING TOPICS AND INFORMATION. THANK YOU. Mixed media is the focus of this episode. 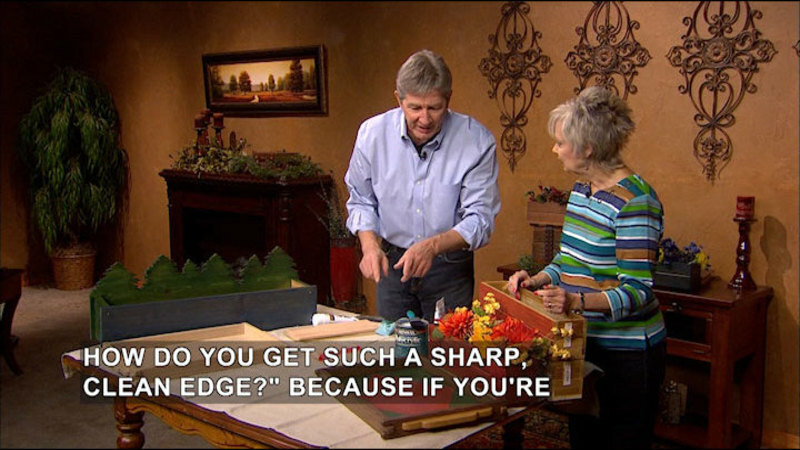 Viewers learn how to make frames using dragonflies and flowers cut outs, chalk pencils, and wooden stamps. 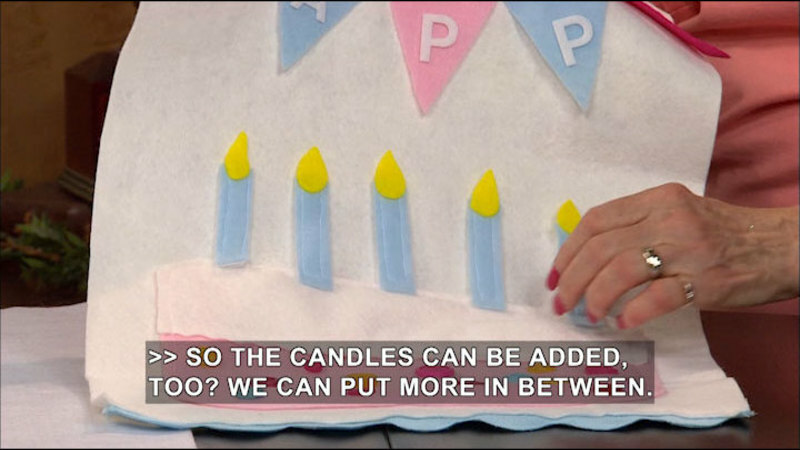 Guests also demonstrate how to decorate snack cakes for different occasions.